Two photos from the weekend. Saturday we took the kids to the National Building Museum, which had a couple exhibits for kids. Should've been more fun, but these two have been mighty clingy lately, which made it hard for them (and us) to enjoy. 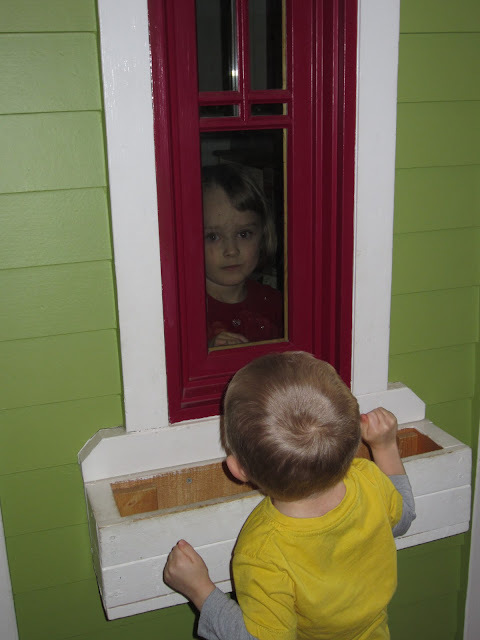 Here's a picture of Tess trying to enjoy the kid-sized playhouse while desperately and frantically checking out the window every 5 seconds to make sure her mom hasn't moved an inch from the spot immediately outside the window that she promised three times over she wouldn't budge from. Tess' family home evening lesson on Sunday was about "homes" and why they are so important. To introduce the topic, she had 3 cups turned upside down and we had to guess which one had a clue inside as to the lesson. Then we had to draw people and make homes for them. You know, because homes are important. It looks like Tess is haunting that house.